I recall back in late 2010 when an eager young research firm practiced what it preached and scoured talented resources on the Indian subcontinent to support our research reports. One such resource was a bright young woman called Reetika Joshi, who worked with us to produce the industry's first ever assessment on "Offshore Analytics Providers." 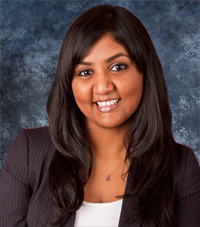 Hi Reetika, how do you see the enterprise analytics services market evolving? The 2015 HfS Enterprise Analytics Services Blueprint Report is a refresh on our initial assessment in November 2013. Compared to 2013, the market is seeing an overwhelming change - an increased focus on applying business context and doing more meaningful analysis, rather than the isolated procurement of analytics tools and technologies. This is impacting the stakeholder dynamic, the decision-making process and day-to-day relationships with service providers for services buyers. It also spells great news for service providers with analytics consulting backgrounds and/or domain expertise for analytics managed services, as services buyers perceive greater confidence in working with these service providers for strategic analytics initiatives that are highly visible in the enterprise. This also means that analytics service providers are having to change their pitches to become less technical (for a non-IT audience) and offer services and solutions that solve specific business challenges. For most service providers, big data and analytics services are the fastest growing businesses in their portfolios. Analytics has been a key area of investment to move up the value chain and provide higher value services for service providers across the market. In terms of demand, we see managed services grow significantly, while analytics project work remains strong. Services buyers are gradually expanding the amount of ongoing decision support services they do with service providers, beyond short term project based work and routine reporting or data cleaning and consolidation. This is due to growing adoption of data-driven decision making within different parts of the enterprise and the need for more analytical support than internal staff can support. Analytics projects are as prevalent as ever, especially with advancements in big data applicability within specific industry verticals and functions giving rise to new opportunities. And how did the Blueprint analysis turn out? Phil, as you know, this year’s Blueprint, based on our updated crowdsourced methodology, has increased the focus on Innovation in analytics service delivery, with 47% of the Blueprint scoring being tied to proven innovation capability and performance for these engagements, beyond the standardized processes in reporting and data management. Overall, we see a shrinking divide between the different categories of enterprise analytics service providers. While this vision hasn’t fully been realized, service providers over the last couple years have invested heavily in developing capabilities across the analytics value chain. Whether they started from traditional strengths in information management, consulting, BI reporting or ongoing research support, they are as aggressive in playing for a piece of the high-value advanced analytics pie with emerging technology expertise. The proof of this pie is in the eating – you can see how placement of service providers across the Blueprint grid is more condensed than in 2013 with high levels of innovation coming from various service providers from a mix of analytics backgrounds. Winner’s Circle features four mainstays and two new entrants. Accenture, IBM, Infosys and Wipro continue to hold onto their market lead based on solid execution of analytics services and delivering on innovation capabilities that are visible to clients. Cognizant entered this group based on its strong connect with clients – account management, playing in its industry specialist niches for advanced analytics and integrating and modernizing its existing information management business. TCS advanced for a focus on developing industry specific solutions. Intense competition among the next hopefuls. 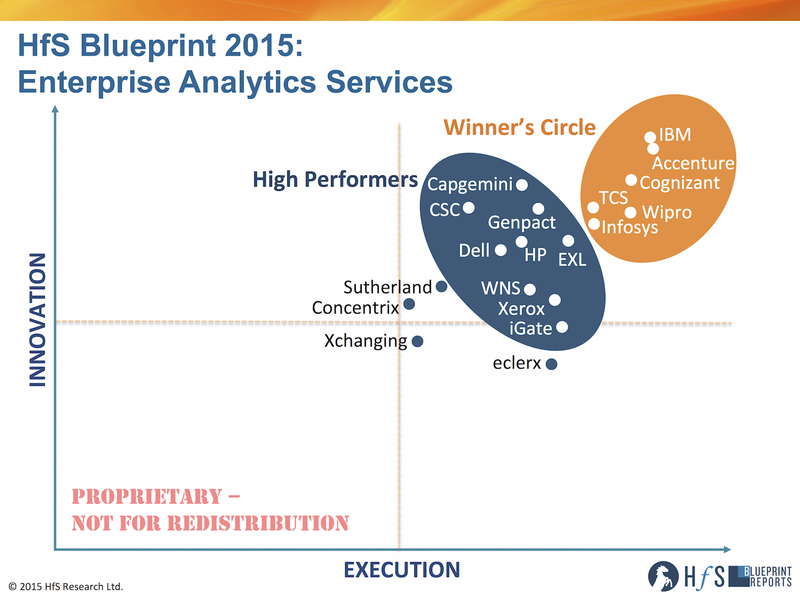 HfS sees strong competition to the Winner’s Circle coming from Capgemini, Genpact, and EXL amongst others. The gap is becoming much smaller for this next rung of service providers that are investing aggressively to win in a rapidly changing market that is rewarding success across the analytics value chain. So what are your key takeaways from this study and what should we be watching for in the next few years? Overall, we believe that the analytics services market is still opportunistic. Service providers are creating more rounded-out offerings by industry verticals and investing with clients to gain more domain expertise in new, emerging areas. Clients, increasingly from business and not IT, are steadily scaling their investments using multiple engagements models depending on their unique business environments and organizational culture. We see an across the board willingness by both services buyers and service providers to experiment in different kinds of pilots and POCs that go into the next level of analytics use case development - not just applying cross-vertical learnings (from retail banking to healthcare), but in conjunction with newer sources of data (e.g. sensors, geolocation mobile data), and new uses of other emerging technologies (e.g. cloud based data warehousing, mobile delivery of reports and insights). Of note, service providers in a bid to develop robust solutions to take to market are funding a significant portion of these initiatives. So expect to see more modernized vertical and functional analytics solutions in the next few years, and a lot more co-innovation coming from service providers partnering with clients and channel partners. Clients will continue to use a wide mix of internal and external talent and technology for different analytics implementations, with no clear model emerging. For some, carving out standardized and repeatable reporting and analysis tasks for third party providers while honing internal talent to do advanced analytics seems to be the answer. Others are collaborating with service providers for technology decisions and implementations more than ongoing analytics support. Others still are critically reliant on the industry-leading insights generated by their service providers’ staffs that are almost seamlessly blended alongside internal teams. Increased deployments of big data programs. A lot more clients are willing to make investments in big data platforms and the analytics and reporting services wrapped around them, through careful piloting and experimentation over the last two years. Service providers finally have a growing roster of large-scale client implementations for big data programs, though some are focused in specific functions/industry verticals. We see a significantly higher number of big data platform implementations, along with the surrounding descriptive and predictive analytics layers, reporting dashboards, ongoing decision support and big data consulting capabilities. Growing aspiration to become an end-to-end analytics partner to clients. Service providers are offering more ‘integrated’ analytics solutions that cut across the analytics value chain (ETL, data prepping and integration, model development, etc.). Instead of focusing on selling these components, providers are promising to integrate them and deliver to business outcomes. However, services buyers in our study were quick to point out relative strengths and weaknesses of the majority of service providers for areas like information management, BI reporting and advanced analytics – both from a capability and perception standpoint. Thus service providers over the next few years will spend much time in a) rebranding their market perception on their ability to service the entire big data and analytics stack and b) integrating and expanding on relatively weak areas. This means more acquisitions to fill gaps, and massive investments in internal capability development. Budgets are now coming from multiple business functions and the potential for growth is huge if the service provider is the first to be established as the company's enterprise-wide analytics partner - not just for data integration, BI or analytics projects, but essentially a COE to draw various capabilities across this value chain. There are a few examples of where market leaders are experimenting with buyers on this model. Success will be determined by how far the service provider is able to penetrate into the client organization’s functions and processes and impact day to day decision making. In summary, the market for enterprise analytics services remains dynamic and evolving and we see potential for significant change to come in 2015 as emerging service providers increase their investments and focus on this offering. We will continue to cover this market throughout 2015 in our HfS soundbites and POVs and expect to see even more improvement in the innovation and execution metrics of all service providers between now and our next Blueprint for this market. HfS readers can click here to view highlights of all our 21 HfS Blueprint reports. #Crazymergerideas &#8211; Infopact or Genosys?